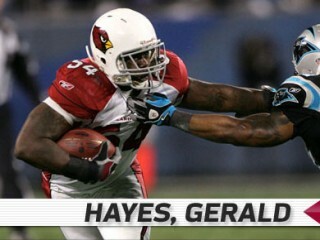 Gerald Hayes is a linebacker for the Arizona Cardinals of the National Football League. In 2005, he had to sit out his third season after he injured his knee in training camp. The Cardinals third-round pick in the 2003 NFL Draft (70th overall), Hayes’ involvement in the defense rose dramatically towards the conclusion of the 2004 season. He was poised to be the Cardinals starter at MLB before a knee injury suffered in the preseason opener sidelined him for the entire 2005 season. A restricted free agent, he signed a one-year qualifying offer with the Cardinals on 4/18/06. Came back to lead the team in tackles (111) in ‘06 despite missing the final two games. Signed a five-year extension on 11/6/06 that will keep him under contract with the team through 2011. 2009: Despite battling through numerous injuries, started 13 of 14 regular season games and one postseason game … in 75th career game registered a team-high three tackles for loss and tied for the team lead with seven total tackles vs. SF (9/13); had two tackles for loss on the opening drive to help force a three-and-out; part of defense that held the 49ers to 21 rushing yards on 25 carries, marking the third lowest rushing total in SF’s history … recorded one forced fumble @ Jax (9/20) … led LBs with eight tackles vs. Hou (10/11); helped prevent Houston from scoring from the one-yard line on three consecutive plays with under two minutes to play … played in 80th career game @ NYG (10/25) and was part of defense that did not allow a 100-yard rusher for the 12th consecutive game (including playoffs) … inactive (back) @ Chi (11/8), ending consecutive games played streak at 39, the longest of his career … inactive (back) vs. Sea (11/15) … returned from back injury to record three tackles @ StL (11/22) … did not start as the Cardinals opened the game with six DBs but recorded four tackles vs. Min (12/6); part of defense that held the Vikings to 62 yards rushing, 67.2 yards below their season average heading into the game (129.2) and held Adrian Peterson to 19 yards on 13 carries, the second lowest yardage output of his career … made fifth postseason start and recorded four tackles in the Wild Card matchup vs. GB (1/10/10) … inactive (ankle) for the Divisional game @ NO (1/16/10). 2008: Started 14 of 16 games and all four postseason contests, recording his third straight 100+ tackle season ... finished third on the team with 107 tackles during the regular season and set a career-high with four forced fumbles ... led team and tied career-high with 14 tackles (11 solo) and one tackle for loss @ Was (9/21) ... did not start as Cardinals opened up with six DBs but still recorded seven tackles and one QB hit @ NYJ (9/28) ... registered five tackles, one forced fumble and one fumble recovery vs. Buf (10/5); his forced fumble led to a Neil Rackers FG to put Arizona up 34-17 and the recovered fumble at the Bills 18 yard-line led to a Tim Hightower TD to increase the lead to 41-17 ... registered team-high eight tackles, one tackle for loss and one QB pressure @ Sea (11/16); helped defense allow a season low 43 yards on 22 carries ... earned first NFC Defensive Player of the Week award of his career after leading the team with 12 tackles, one tackle for loss, a half-sack and a career-high two forced fumbles vs. StL (12/7); first forced fumble stopped the Rams at the Arizona 22-yard line and second fumble was recovered by DT Darnell Dockett and returned for a TD to make it 27-7 in the 3rd quarter ... led LBs with 10 tackles, one tackle for loss, one QB hit and forced RB Adrian Peterson to fumble and then recovered it at the AZ nine yard-line vs. Min (12/14) ... started first career playoff game and recorded one tackle for loss vs. Atl (1/3/09) ... registered first career postseason INT @ Car (1/10/09) ... finished second on the team with six tackles and one QB hit vs. Phi (1/18/09) ... for the second consecutive week was second on the team in tackles with seven vs. Pit (2/1/09) in SB XLIII. 2007: Started all 16 games registering second straight 100+ tackle season while leading or sharing the team lead in tackles in five games; selected as one of five team captains for the season … opened the season with a sack @ SF (9/10) … led team with eight tackles and forced a Matt Hasselbeck fumble that set up game winning 42-yard FG by Neil Rackers in the home opener vs. Sea (9/16) … for second consecutive week, led team and tied his career-high with 13 tackles and one tackle for loss @ Bal (9/23) … part of defense @ Was (10/21) that held the Redskins to 160 total net yards, the lowest output by a Cardinals opponent since the L.A. Rams had 152 yards total offense on 9/4/94 … totaled 10 unassisted tackles with two tackles for loss and one sack @ TB (11/4) … recorded two tackles vs. Det (11/11) and helped hold Lions to -18 rushing yards, which is the lowest total in the modern era … led team with 14 tackles and one sack vs. SF (11/25) … led team with 11 unassisted tackles and one sack @ NO (12/16); eclipsed 100 tackles for the second straight season (103 in 2006) … tied for team lead with six tackles and returned a fourth quarter INT 30-yards for first career TD vs. StL (12/30); 115 tackles surpassed previous single season career-high of 111 tackles set in 2006; finished season second on the team in tackles, two behind Karlos Dansby. 2006: Made an impressive return to action after missing the entire 2005 regular season with a knee injury, starting all 14 games he appeared in and eclipsed the 100-tackle mark despite missing the final two games due to injury (rib) … recorded six tackles, two tackles for loss, his first career sack and a fumble recovery while starting at MLB in the season opener vs. SF (9/10) … continued his strong play collecting five tackles, one pass defensed and his first career INT on a Matt Hasselbeck pass deep in Cardinals territory in the second quarter @ Sea (9/17) … recorded 12 tackles, one for a loss, and also recovered his second fumble in three games vs. StL (9/24) … turned in another strong performance, this one on Monday Night vs. Chi (10/16), collecting seven tackles and an INT off of Rex Grossman … had a game-high 13 total tackles @ Oak (10/22) … reached double-digit tackles for the third time this season when he recorded 11 tackles, with one for loss vs. Dal (11/12) … led all LBs with six tackles and his first quarter pass deflection in the Cardinals red zone was intercepted by FS Aaron Francisco at the three yard line and kept the Lions off the scoreboard vs. Det (11/19) … tied for a team-high nine tackles and also intercepted a Marc Bulger pass to end the game after the Rams had just recovered an onside kick @ StL (12/3) … went over 100 tackles (102) for the first time in his career when he collected seven tackles vs. Sea (12/10) … inactive (rib) for the final two games of the season. 2005: Was inactive for the first four games of the season with a left knee injury suffered during the preseason … placed on injured reserve on 10/6. 2004: Saw action in all 16 games for the Cardinals … recovered an Aaron Brooks fumble for his first career fumble recovery in the Arizona end zone to end the Saints first drive of the game vs. NO (10/3); recorded one tackle on special teams … blocked a Donnie Jones punt vs. Sea (10/24) which went out of the back of the end zone causing a safety and putting the Cardinals ahead 18-17 with 8:50 remaining in the game … broke into the starting lineup and recorded a team-high nine tackles in his first extended defensive action; forced a fumble by RB Shaun Alexander @ Sea (12/26). 2003: Early-season action came primarily on special teams with two tackles vs. GB (9/21) and @ Dal (10/5) … inactive for four games with a shoulder injury … recorded a season-best five solo tackles, seven overall @ SF (12/7) … first NFL start at OLB resulted in four solo tackles and two assists vs. Car (12/14) … reserve action @ Sea (12/21) resulted in seven tackles from scrimmage and two tackles on kick coverage units … starting role at OLB vs. Min (12/28) produced four solo tackles, two assists, two hurries and season-best three solo tackles on special teams. Three-time first-team all-Big East Conference selection at Pittsburgh … first Panther defender to record three consecutive 100-tackle seasons since All-American LB Olsavsky accomplished the feat from 1986–88 … career statistics include 387 total tackles (243 solos), 13.5 sacks, nine pass deflections, and two INTs with starts in 36 of 44 games … only Tom Tumulty (413, 1991–95), Hugh Green (441, 1977–80) and Arnie Weatherington (477, 1973–76) recorded more tackles in their Panther careers. Full name Gerald Benjamin Hayes … college teammate of Cardinals WR Larry Fitzgerald … as an artist in high school, won numerous awards for his pencil drawings which traveled to numerous galleries throughout New Jersey … Administration of Justice major. View the full website biography of Gerald Hayes.